B(l)ooming news! The new gerbera assortment is now available with 95 new varieties, both mini's, large-flowered and specialties. We'd like to inform you about our novelties and the new assortment poster. We've updated the gerbera assortment on our website so florists, exporters and wholesalers from all over the world can view the latest gerbera assortment, including our new varieties. 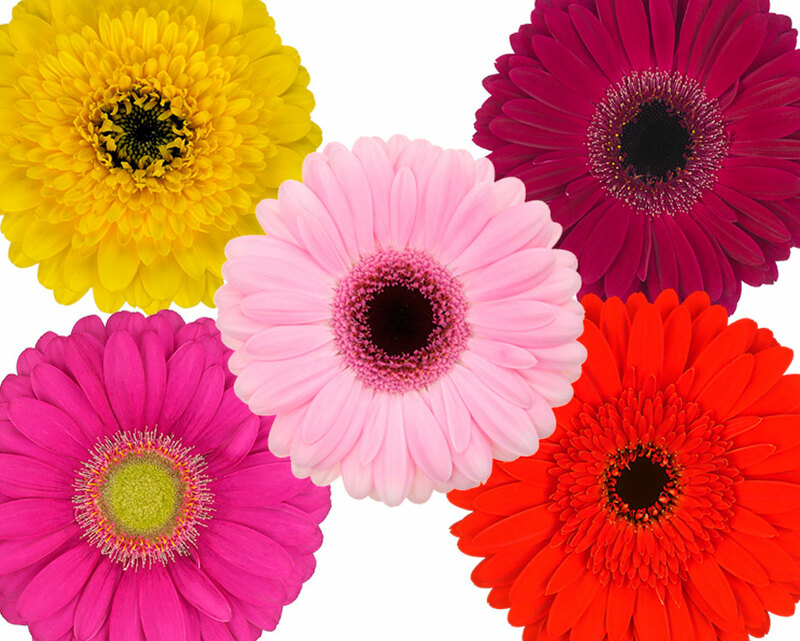 With our tool you can easily filter the gerbera colour and type of your choice. Or filter the newest gerbera types. There are 615 gerbera varieties available of which 95 gerberas are new: small and large flowered, specialties and standard. From Piccolini to Pomponi to Pastini and many more. Did you know members can download high quality images of all our gerberas by logging in on our website? Not a Coloured by Gerbera member yet? Register now! Thanks to a collaboration between Royal FloraHolland and the Dutch gerbera breeders the Novelties Gerbera poster 2018 is established. All new breeds are listed with the associated grower(s). The poster is online available and at all the locations of Royal FloraHolland and auction Rhein-Maas. As a member you are the first to receive the Novelties Gerbera poster in your mailbox. Download the assortment poster and discover the 95 NEW gerbera varieties. Vul je gegevens in en ontvang het magazine in jouw e-mail! Wij verwerken uw gegevens conform het privacybeleid. Enter your details and receive the magazine in your inbox! Nachdem Sie Ihre Daten eingegeben haben, erhalten Sie das Magazin in Ihrem Mail-Postfach! Wir verarbeiten Ihre Daten gemäß unserer Datenschutzerklärung. Indiquez vos coordonnées et vous recevrez le magazine par e-mail! Nous traitons vos données conformément à la déclaration de vie privée. Укажите свои данные и получите журнал на свой e-mail! Мы обрабатываем ваши данные в соответствии с политикой конфиденциальности. Wil jij de beelden in hoge resolutie downloaden? Vul jouw gegevens in en ontvang de poster in jouw mailbox! Do you want to download the high resolution images? Möchten Sie die hochauflösenden Bilder herunterladen? Voulez-vous télécharger les images haute résolution? Enter your details and receive the poster in your inbox! Оставайтесь в курсе самых свежих новостей! Первыми получайте новости о тенденциях в цветочном мире. Enter your details and receive the brochure in your inbox! Enter your details and receive the novelties poster in your mailbox. We appreciate it if you share our name Coloured by Gerbera when you use our photos. Enter your details and receive the inspiration boards in your mailbox.